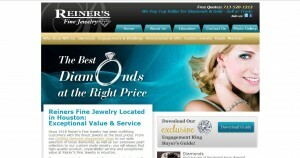 Reiner’s Fine Jewelry address, phone, website, hours of operation, and more. Since 1918 Reiner‘s Fine Jewelry has been outfitting customers with the finest jewelry at the best prices. 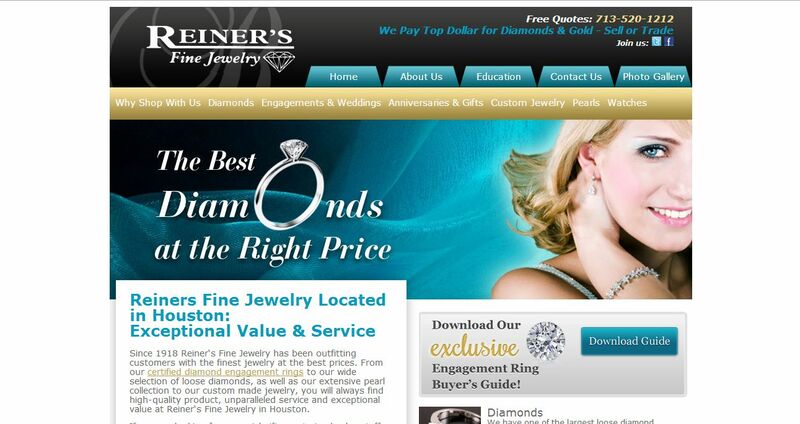 From our certified diamond engagement rings to our wide selection of loose diamonds, as well as our extensive pearl collection to our custom made jewelry, you will always find high-quality product, unparalleled service and exceptional value at Reiner‘s Fine Jewelry in Houston. If you are looking for a special gift, our trained sales staff will help you select that unique gift only dreamed about, or Reiner‘s can custom make one for you. Our jewelers in Houston and our master designers of fine jewelry, can make custom diamond pendants, wedding rings, and othercustom made jewelry not found elsewhere, and it doesn‘t have to cost you a fortune. If your custom jewelry includes diamonds, we will help you select them as well. Reiner‘s has one of the largest selections of quality loose diamonds in Houston and we only offer diamonds certified by the GIA. The Gemological Institute of America is the world‘s most accurate and trusted authority in diamond grading, so you‘ll know and can trust the quality of what you are purchasing.